One of the great myths about ASD is that individuals who are diagnosed with the disorder have no emotions - that they are somehow like Mr Spock from Star Trek. Our research in the Autism Research Group shows that this is not the case. Although individuals with ASD may express and experience their emotions differently, they do not lack emotions altogether. In fact, a very large proportion of adolescents and adults with ASD suffer from anxiety and depression and more research is needed to shape strategies of how best to help them through such difficulties. When you say individuals with ASD experience emotions differently, what do you mean exactly? This is a really difficult question because we can never know for sure what it 'feels' like to be someone else. However, on self-report questionnaire measures, individuals with ASD often report that they experience difficulties identifying and describing their own emotions. Our research suggests that there are at least two reasons for this. First, we have found that both individuals with and without ASD remember emotional events better than neutral ones, but this memory advantage fades more quickly over time for individuals with ASD. This is relevant to the question of why individuals with ASD might experience difficulties identifying their own emotions. People generally learn about what it's like to feel a certain way by accumulating lots of memories about times when they felt a similar way. Imagine, for example, if you felt something you have never felt before - you would probably not be able to identify the feeling or describe it very well; instead you may begin to feel anxious. In our most recent work, we have discovered that the extent to which individuals with ASD report difficulties identifying their own emotions is closely associated with the extent to which their reported feelings relate to their physiological arousal levels. To give an example, imagine you were confronted with a spider and asked about how it made you feel. Typically, your reported feeling would reflect your body's arousal level (the 'fight-or-flight' response), which can be measured by monitoring how much your palms sweat. 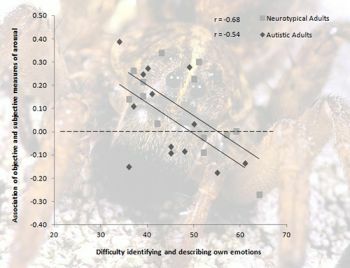 In individuals with ASD who report difficulties identifying their own emotions, this association between subjective and objective measures of arousal is much reduced. As hinted to above, we need more research to better understand how we can help individuals with ASD through periods of anxiety and/or depression. We are currently pursuing funding to allow us to look into these issues and we believe that our work so far provides the solid foundations needed to make important contributions in this area.